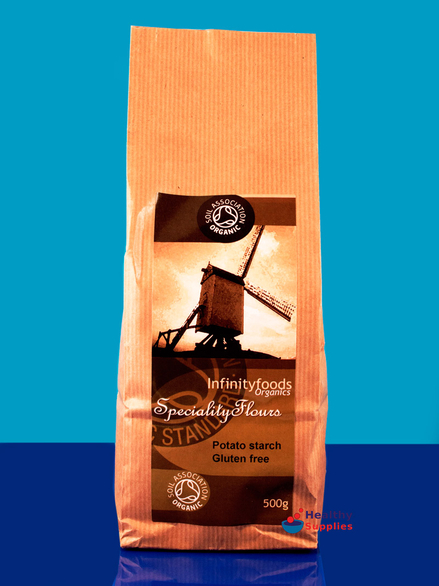 Potato Flour/Starch 500g, Organic (Infinity Foods) - HealthySupplies.co.uk. Buy Online. 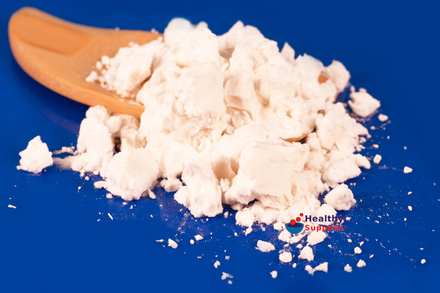 This potato flour is also known as potato starch. It may be used in combination with other flours whilst baking. Can be used in cooking & thickening soups. Use this potato flour as a binding flour when making gluten-free bread. It performs a similar role to tapioca flour or rice flour: it is sticky and will hold other flours together such as buckwheat flour. You typically add up to 30% potato flour together with 70% buckwheat or rice flour to make up a balanced bread mix. Potato flour is also suitable for scone and cake recipes, used alongside additional flours such as buckwheat or rice flour. Potato flour/starch is also used to thicken sauces, gravies and soups. 1kg for £6.49 or buy 3 for £6.17 each. Note: adding water to potato flour does not create mashed potato! Important Note: This form of potato flour is of the type also known as "potato starch". It is made from the starch of the whole potato, and is not the whole potato. Use this potato flour in baking, as a binding flour and for thickening purpose. This potato flour does not have a potato flavour and will not by itself make potato soup!